Amsterdam Airport (IATA: AMS, ICAO: EHAM), also known as Schiphol Airport, is the leading airport of the Netherlands. It was opened on 16 September 1916 initially as a military airbase with only a few runways and platforms for landing. By the end of the World War I the airport lost its military role and was used in civilian needs only with the newly built four maximum 1020 meters length asphalt runways. Amsterdam Airport Schiphol (IATA: AMS, ICAO: EHAM) is the main airport of the Netherlands located 9 kilometers (5.5 miles) southwest of Amsterdam, Haarlemmermeer municipality, North Holland or just in a 20-minute drive from downtown of the city. It is regarded as the 3rd busiest airport in Europe with 68.5 million passengers passing through the airport in 2017. Schiphol owns 6 runways (3800 m., 3500 m., 3453 m., 3400 m., 3300 m., 2014 m. relatively). The overall area of the airport is 2787 hectares of land. Schiphol is geographically one of the world's lowest European airports, it is located 3.4 meters (11 feet) below sea level. AMS is known for its ‘one-terminal’ concept and is divided into 3 sections/ halls with 8 piers which are interconnected, except pier M from which the passenger cannot enter any other hall. Moreover, Schengen and Non-Schengen areas are still separated from each other. AMS provides 165 boarding gates with 18 double jetway gates for widebody aircraft. With the limit for 500 000 flights annually, it offers international and domestic flights to 301 destinations across Europe, North America, and Asia. While having the airport facilities and the gateways under a single roof, all of the 3 halls are connected in the Schiphol Plaza, which not only is the central office but also serves as the additional source of the revenue while being a hub for a shopping center and the railway station. The airport operates under the management of the Royal Schiphol Group. The airport is the hub for national airlines KLM and KLM Cityhoppers, Corendon Dutch Airlines, Transavia, TUI fly Netherlands, Martinair, and for European airlines Jet Airways, Vueling, and EasyJet. Amsterdam is the capital of the Netherlands, although the seat of the government is in The Hague. The city is located in the western part of the country-province of North Holland- however, is not its capital which, in turn, is Haarlem. The city origin is situated around a dam in the river Amstel, which became the derivative for the city name. Amsterdam has connections with the North Sea through the North Sea Canal. The population within the city proper has reached around 851 373 citizens, 1 351 587 in the City Region of Amsterdam (an urban area) and 2 410 960 in the Amsterdam metropolitan area. 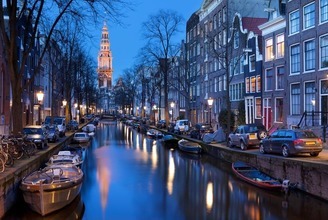 Nowadays Amsterdam is not only historical but the rather commercial capital of the Netherlands. Being one of the most financially developed centers in Europe, it is regarded as a global/alpha city by the Globalization and World Cities (GaWC) study group. It was also ranked as the 5th best European city to locate an international business in. The city is known for its historical sites and events, its nightlife and festival activity, that attracts around 5 million visitors annually. For instance, Amsterdam Canals and Defence Line of Amsterdam, 135-kilometer ring of fortification, are on the UNESCO World Heritage List. The AMS is located at the Amsterdam Schiphol Airport, Post office box 7501 1118 ZG, Schiphol, Netherlands. It is located 9 kilometers or 20-minute ride southwest of Amsterdam in the municipality of Haarlemmermeer. After Security Control passengers and guests of an airport might shop at tax-free prices. However, the boarding card is needed in order to shop at the Duty-Free area. All may enjoy a wide range of clothing and other items by the affordable prices. Notably, two different prices are applicable for tobacco: tax-free for passengers flying outside of EU and at the same prices to passengers flying with the borders of EU. All shops are opened 1.5 hours before the first flight and 0.5 hours after the last one and may be found in Lounge areas 1, 2, and 3 after the security control. The one may find several sections at the Duty-Free: Perfumes and Cosmetics section; Chocolates, Liquor & Tobacco section; and even the House of Tulips on the Holland Boulevard. Shops available after the security control are Bottega Veneta, Burberry, Bvlgari, Coco, Dutch Discoveries, Drugstore, Electronics, Fine Chocolates, Gassan Trends, Gucci, Hermes, Kiehl’s, MAC Cosmetics, Montblanc, Omega, Rituals, Rolex, Say Cheese, Swarovski, Swatch, Victoria’s Secret and many more. The Amsterdam Airport provides the passengers with the transfer service carrying them from an airport to the hotel or any other desired destination and vice versa. A professional driver will meet the passenger at the airport and carry him/her to the destination point. However, the one shall indicate all of the details of transfer in advance to avoid any possible confusion. Prices for the service differ depending on the type of the car provided and destination pointed out. Therefore, the fee for one-way minivan transfer can reach at least 75 euros per 8 people. Two-way minivan transfer will cost approximately 150 euros. Regular Taxi one-way transfer for 4 people will cost around 60 euros. Two-way taxi transfer price is 120 euros.